A few weeks ago we discovered that some barriers and fencing that had been bought and donated over the past 6 years had been stolen from the concert ground. We were shocked and upset that this had happened – and the Police had similar feelings when they came to investigate. Rock against Cancer is a charity event – all profits from the concert are donated to charity so there is no residual money to replace what has been stolen. 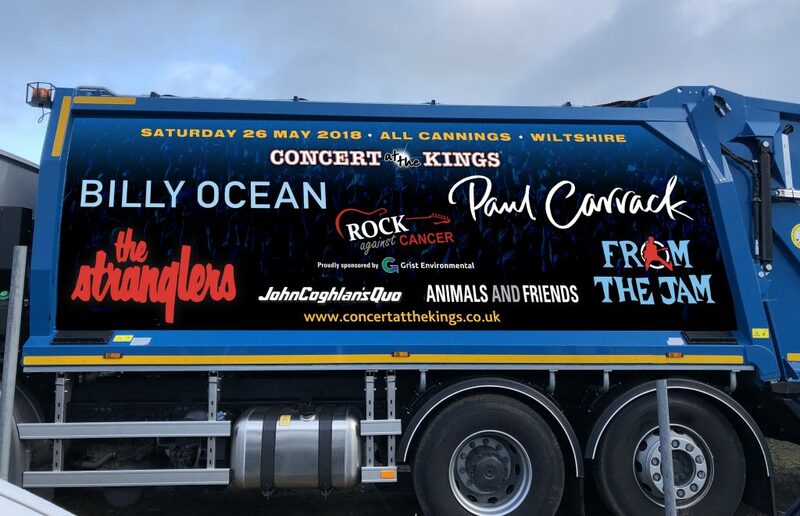 But one of our long-term supporters – Grist Environmental – have stepped in and with a quite astounding gesture have offered a free loan of barriers similar to ones stolen and will provide free hire of toilets and a full clean-up service on the day and after the Concert At The Kings in All Cannings. And in the lead up to the Concert you may well see one of Grist Environmental’s vehicles proudly advertising the event down your road. They have kindly allowed us to wrap one of their refuse trucks with an ad for this year’s concert. So the new blue Concert at the Kings ads will be getting an airing over the coming months early in the morning. Thank you again to Nigel and Marcus Grist and Jonathon Taylor for their help.